We’d love your help. Let us know what’s wrong with this preview of Finding Livelihood by Nancy J. Nordenson. Finding Livelihood is a book about work for grown-ups. It’s about not just the work we thought we wanted but about the work we found and the work that found us. It’s also about the work w When we were young, they asked us what we wanted to be when we grew up. Those answers were our childhood dreams. The reality of adulthood is that what we are and do now is what we became. 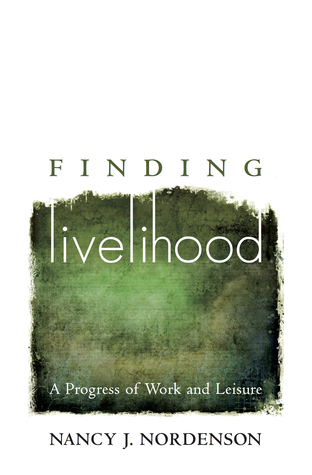 Finding Livelihood is a book about work for grown-ups. It’s about not just the work we thought we wanted but about the work we found and the work that found us. It’s also about the work we have lost. To ask other readers questions about Finding Livelihood, please sign up. When I decided to write a review of Nancy J. Nordenson's Finding Livelihood: A Progress of Work and Leisure, the first word that came to mind was "impressionist". And indeed, her book on calling and vocation does not so much state her perspective directly as it leaves the reader, through vignettes of her own life and through other illustrations, with a distinct impression of what she is conveying. So subtle can the distinctions between her stories be, often interweaving two or more in a chapter, When I decided to write a review of Nancy J. Nordenson's Finding Livelihood: A Progress of Work and Leisure, the first word that came to mind was "impressionist". And indeed, her book on calling and vocation does not so much state her perspective directly as it leaves the reader, through vignettes of her own life and through other illustrations, with a distinct impression of what she is conveying. So subtle can the distinctions between her stories be, often interweaving two or more in a chapter, that it can be easy to miss the point she is trying to make. In this sense, her work is distinctly artistic. But on other, I would have to say that her book is also iconic. Not only does her book, through the use of personal stories and reflections on art and literature, reflect the way in which the Divine shines through and is mediated by the natural world, as icons do, but she also at one point quotes from Russian Orthodox thinker and priest, Pavel Florensky, when she borrows the phrase, "a beholding that ascends". Florensky was specifically describing the religious impact of icons in that phrase. There is another sense in which her theology of vocation is iconic. It comes through in the way in which she perceives and writes about one's calling. Where it has become popular in certain evangelical circles to cite Frederick Buechner's "the place God calls you to is the place where your deep gladness and the world's deep hunger meet", Nancy Nordenson takes a different approach or, at the very least, a different emphasis. Buechner's quote is one I have often found inspiring myself, but I have to admit it can be a tad idealistic, being actualized very seldomly in a reality tainted by sin and the effects of the Fall. Thus, Nordenson takes the tack that much of our calling is lived out in places of necessity and pragmatism. She writes that "work, even good work for which we are grateful and love, has a shadow side." And her own life illustrates this. Much of the book, especially later on, is taken up with reflections during her time having to work after her husband lost his job. She had planned to reduce her work schedule while going through graduate school, but found herself adjusting to the reality of what was. The book itself is presented in three "acts". The first act reflects on the limitations of life, "where we encounter ground level and metaphysical realities...idealistic work experts and criteria for 'good work'; hiddenness and exhaustion; and a longing for meaning and a will to be satisfied." The second act is primarily on learning to rest and paying attention to what is unfolding before us in our life and work. It is in this act that one reads Florensky's quote and sees how she applies the concept of beholding to one's vocation. It is also at the end of this part that she writes the chapter about her husband coming home after losing his job. Prior to this, her reflections were based on earlier memories of past work experiences, but with the last chapter of Act II, the readers is segued into Act III, "where we encounter love, devotion, and guidance; the sacrament of the present moment and every moment;...patience and transformation; and a blessing of countenance." For me, one of the joys of this book was her interaction with other writers and thinkers that I am fond of. These include quotes from Simone Weil and Dietrich Bonhoeffer, Dorothy Sayers and C.S. Lewis, Julian of Norwich and The Cloud of Unknowing, T.S. Eliot and Gerard Manley Hopkins. But as one might guess from the quote above regarding Act III, she quotes from that French mystic, Jean-Pierre de Caussade, in his book The Sacrament of the Present Moment. And this reinforces the iconographic nature of her writing. For, in attending to the moments of her life and her work as present realities which mediate God's grace, she is able to write, "On one level we make our livelihood; on another level we keep our eyes open and find it." Nancy Nordenson's book is a testament to what revelations can result when we open our eyes to what is in front of us and receive it as grace. Truly, in the reading of this book one is engaging in a beholding that ascends. Marvelously crafted lyrical essays on the search for meaning, satisfaction, and joy in the gritty realities of work. An exceptionally well-written meditation on work with an eye on both the ideals and realities of what we do. Nordenson's reflections pull from her life and her research to draw out the reader's own contemplation of why we do what we do and how we are defined by our work, or the loss of it. I read it almost devotionally, meditatively, searchingly; it elevated work to its proper place as a spiritual practice which daily affects us all. Frederick Buechner, in his book, Wishful Thinking (1973), says, “The place God calls you is the place where your deep gladness and the world’s deep hunger meet.” This must be the most quoted definition of vocation in contemporary literature on calling and work, the only problem being that it isn’t really true. It’s a good line, and it sounds good when you’re 19 (it did to me), but easy acceptance of this phrase is quickly challenged by the question of “what happens when the world’s hunger requ Frederick Buechner, in his book, Wishful Thinking (1973), says, “The place God calls you is the place where your deep gladness and the world’s deep hunger meet.” This must be the most quoted definition of vocation in contemporary literature on calling and work, the only problem being that it isn’t really true. It’s a good line, and it sounds good when you’re 19 (it did to me), but easy acceptance of this phrase is quickly challenged by the question of “what happens when the world’s hunger requires something of me I am not glad to give?” A glance at scripture, at history, at your own life and the lives of those around you, reveals that it is a matter of when, not if, you will be asked to give something that hurts rather than provides gladness if you are to follow God’s calling in a broken world. When you’re 19 this reality is perhaps less clear (and not particularly welcome as you plot your glorious plan for your life). Since I love Buechner, I should note that less frequently referenced is his “Memoir of Vocation,” Now and Then (1983), a book that offers a more nuanced exploration of calling and the lived experience of work. In Now and Then Buechner doesn’t describe the easy convergence of personal gladness and worldly need, but instead describes a journey of wrong turns, of frustration, of set backs, of confusion, of minor victories, in the pursuit of his calling. The most famous quote of that book suggests that in listening to our life the “boredom and pain” of life is no less holy, no less a gift of grace, than its “gladness.” And many find as they grow older that boredom and pain may be the defining features of their working lives, rather than deep gladness. In a series of “lyric” essays, Nordenson enters into the details of a working life (she earns her living as a freelance medical writer) that often get glossed over in more abstract and theoretical descriptions of work: meeting deadlines, the pain of being laid off, the frustrations of the job search, of doing work that seems disconnected from “my calling,” of the bills that show up in the mailbox every month and the alarm clock that rings every day. The figures Nordenson references are not the latest productivity gurus, nor the latest behavioral economics studies, but figures like Simone Weil, Dietrich Bonhoeffer and Josef Pieper. This is not a how-to guide, or a book stuffed with answers to the dilemmas many (most, if the statistics concerning work satisfaction are any guide) people face with regard to work. The lyric style Nordenson uses relies on a “nonlinear structure, white space, metaphor and a slant-angle perspective. It is a way of exploring, not a way of explaining.” It requires and rewards patience, and leaves the reader with plenty of work to do on her own. It is this style that lets Nordenson explore some areas of work that other more “explanatory” books do not, even if my one complaint with the book is that I did feel as though some of the essays lost a certain amount of momentum and direction. My favorite essays were likely the “Summa Laborum” chapters, modeled on the rhetorical structure of Aquinas’ Summa Theologica. The structure of those particular chapters gives shape to Nordenson’s reflections as she starts with questions like “Should money be excluded from a discussion about the meaning of work?” and works through reasons to answer yes, or no. I wanted this book to tell me -- artfully -- what to do when I grow up. I am in a floundering season and this title looked promising. Instead Nancy Nordenson validated -- artfully -- the pain of not quite knowing one's own vocation. And, if suspecting, trudging up hill to make one's livelihood from that vocation. Each chapter works together, but can also stand alone as an essay, tying together seemingly mundane daily observations into themes of desire, doubt and calling. Woven throughout are the I wanted this book to tell me -- artfully -- what to do when I grow up. I am in a floundering season and this title looked promising. Instead Nancy Nordenson validated -- artfully -- the pain of not quite knowing one's own vocation. And, if suspecting, trudging up hill to make one's livelihood from that vocation. Each chapter works together, but can also stand alone as an essay, tying together seemingly mundane daily observations into themes of desire, doubt and calling. Woven throughout are the threads of Nordenson's own story with her husband, a painful struggle with unemployment and underemployment and goodhearted faithfulness. As a writer who makes a living writing medical reports (her BA is in biology) while simultaneously pursuing her MFA in Creative Writing, Nordenson's prose manages to be both pragmatic and poetic, a tone which I thoroughly enjoyed. If you prefer linear storytelling or bullet lists of tips, this book is not for you. I love this book! Here it is on the morning of Christmas Eve when I need to start some cinnamon rolls and run to the drug store before family arrives with a toddler whom I love and whom will keep me very busy, but I've sat down to reread parts and a new chapter and I feel myself newly inspired to plunge into my work of cooking and tidying with zest. Before you read further, It is a book for adults who have already experienced the world of work. It is a book for those who love the beauty of langu I love this book! Here it is on the morning of Christmas Eve when I need to start some cinnamon rolls and run to the drug store before family arrives with a toddler whom I love and whom will keep me very busy, but I've sat down to reread parts and a new chapter and I feel myself newly inspired to plunge into my work of cooking and tidying with zest. Before you read further, It is a book for adults who have already experienced the world of work. It is a book for those who love the beauty of language and wish to enter into a reflective journey. It's not for those who want to taker personality assessments or be told what to do in a serious of steps (that don't work for the many anyways). It takes you far beyond the books What Color is Your Parachute or Work (Stud Terkel) and deftly disassembles Buechner's assertion that God calls us to a place where our deep joy and the world's deep hunger meet. If you haven't found that true for you and are wondering why or what to do about it, reading this book. I love how these reflections take seriously the complexity and mystery of where work and love meet. I appreciate the book's real-life anecdotes about the intersections between real life on the job (not star-studded promise) and the dreams we drew on in setting our course; the intersections it ponders regarding God's help and grace over and around us and the actuality of tedious, back-breaking work and deep disappointments encountered within it-- realities such as teenager (an the author's son) beginning his summer job and plunging nine-feet from a scaffold to a concrete floor and needing three surgeries thereafter. The author extraordinary pondering of her topic makes the book a unique contribution to the question of how work can become infused with meaning, of how we can quest on the job to experience "a transcendent and God-filled reality." She brings to bear her medical background as a writer in that field and her reading of other contemporary books exploring work, but - unlike so many authors - always keeps one foot grounded in the real world. A few quotes from the prologue: "This book is about wrestling with work as with any large and powerful force that wants to have its way with you while you simultaneously want to have your way with it...this book adds...a meddling and contemplative voice, a voice trying to speak into the tension between passion and need, between aspiration and limits, between the planned life and the given life." Work as expression of our deepest selves. In a series of lyrical essays, author Nancy J. Nordenson explores the nature of work as a place of intersection between the practical and the spiritual. She does this in language so gorgeous, it’s tempting to linger over each image and turn of phrase. Luckily the subject matter pulls the reader through. “Work” in Nordenson’s view, is a mutable concept, a series of competing imperatives that exert a constant push-pull betw Work as necessity. “Work” in Nordenson’s view, is a mutable concept, a series of competing imperatives that exert a constant push-pull between the life we want and the one we end up with. Responsibility vs. freedom. The individual vs. the collective. Creativity vs. practicality. There’s no escape from this whirl of duality, only an ever-shifting accommodation. So much of the meaning of what we do is in the DOING, the figuring things out, the balancing of our needs and our desires. Nordenson grounds her spiritual and philosophical exploration firmly in the practical using stories from her own work life and that of her husband–the ups and the downs–to demonstrate that one still must make a life even as they are “making do,” and how so much of our day-to-day contentment is a matter of knowing what is in our control and what it not. Negotiating where we can. Accepting what cannot be negotiated. Sometimes acceptance might mean getting on with an imperfect situation, or it might mean cutting our losses. On a personal level, the concept that most resonated for me was that when it comes to human effort value and compensation often have very little to do with one another. This is a pretty radical assertion in a culture that places so much emphasis the bottom line and too readily confuses a person’s worth with their annual income even as the notion job security goes the way of the dinosaurs. This book is a book I obtained for free from goodreads giveaway. It makes you look I side your inner self to decipher what truly is good for you and fulfilling, making one weigh physical and spiritual side of decisions.